Every now and then you’ll read (or hear, if you listen to the audio commentary) one of these Weekly Fifty posts where I discuss the photographic opportunities that abound right in front of our eyes even in the simple mundane activities that make up our daily lives. Photo opportunities are all around us if we are willing to look for them, and this image is an illustration of what I mean when I say this sort of thing. To wit: it’s not an exceptional image in terms of the sheer artistry or composition, but it does serve as a bit of a visual reminder to me, and maybe even to you, that you don’t need fancy gear or special subjects to take good pictures. I shot this about 6am in mid-April when I was getting dinner ready before the rest of my family woke up. My wife and I are big fans of slow cooker dinners, and we will often get supper ready many hours in advance so we can just sit down with the kids for family meal time without having to prepare anything right in the moment. 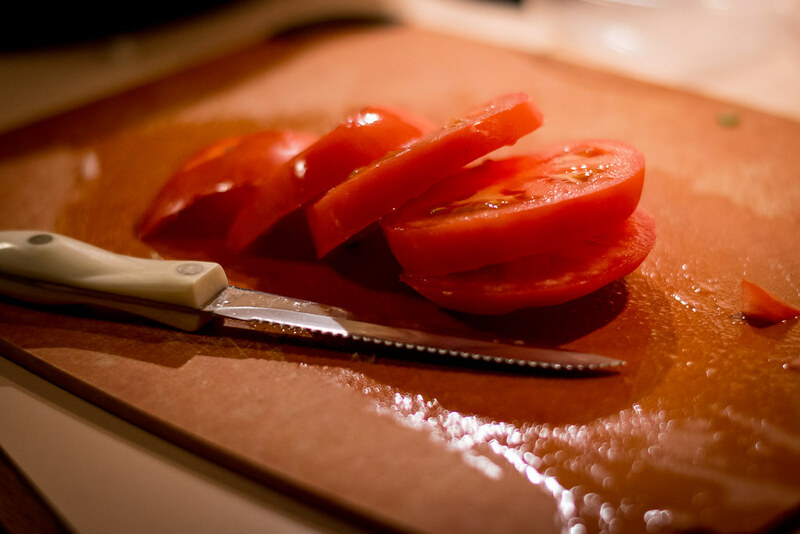 On this particular morning I had just finished cutting up a pepper and some onions and was in the middle of slicing this tomato when I thought of using it for a bit of an impromptu photo-op. I ran to fetch my camera (this time my D7100 + 50mm lens) made three images, all at f/1.8 about ISO 1100 (it varied slightly between each shot) and went back to dinner prep. The whole thing took about 40 seconds from the time I put down the knife to the time I picked it back up, and when it was done I felt like I had a cool little image of a sliced tomato while also learning something along the way. This would be a perfectly serviceable photo if it was the final product, but it’s not. I didn’t make a sliced tomato for dinner, and as such this photo feels incomplete and a bit empty. After I realized this I quickly grabbed the knife I was using to slice it, put it in the foreground, and took the third and final picture which is much more well-rounded and interesting than this one. I also made sure to include the small chunk of tomato on the right-hand side in the final image as well, as it adds a dynamic element to the image–it helps tell a story that there was more to this photo than what you see, and clearly there is still more work to be done on this round red fruit. Or vegetable. Or however it’s classified. Simon, should have taken a picture of the final product as well , would have loved to see what the slow cooked pork looked liked :) Either way your entry this week made a lot of sense and gave me personally excellent advice to follow. Sometimes I find my self cropping a picture because I want to zoom into that tiny item that was my original focus and realize that the surroundings are what made the picture. ” The sum of the parts that make the whole.” Thank you. I appreciate the textures, warmth, and dramatic light. Inspirational story of the “Tomato.” Seizing every opportunity to see and of course having the camera with you helps but if you don’t have your camera your eyes are after all your lenses and they’re in blinking health to capture your vision without the camera. To the point, your text says 6am (The morning…OR is it so morning the sun isn’t up yet for you at your location?). I ask because I’ve always prefered some type of reflected, diffused or even direct on a cloudy day – natural daylight, for any food/ meal image. It just seems to compliment the relationship of us, to the natural un-manmade parts of our lives. Good question, Frank. And yes I meant 6am, as in, very early morning. Sadly there was no natural light coming from the windows when I took this shot so all the light is artificial and coming from the task lighting in my kitchen. It’s not an ideal setup, and for proper food photography you would not want this much contrast between a very dark foreground and brightly-lit background, but I figured it was more of a learning opportunity for me than anything. Simon, this is has really struck a chord with me. We don’t have to go searching for spectacular locations all the time to get good photos. Photo opportunities are all around us when we use our imagination and try something different to what we normally would. That’s such a humbling thing for me to read, Mark, and I’m so glad this photo has resonated with you. I sometimes get stuck in a rut where I’m not sure what to photograph or think there is no way I could find anything interesting in my immediate surroundings, but it’s times like that when I usually realize that if I just pick up my camera and start looking something will usually come up. Like you said, we don’t always need to search for something spectacular. Sometimes the spectacular is right in front of us and we don’t even realize it! Interesting photo….I have been following your blog for a short while, and really enjoy hearing how and why your photographs were made…..I also enjoy seeing the little slices of your life(and tomatoes) as well….keep up the good work…. Thank you for your kind words Joel. I’m so glad to have you as a follower of this blog! I agree. The photo with the knife is the more effective presentation of the “slicing event”. Was the ISO different as well? 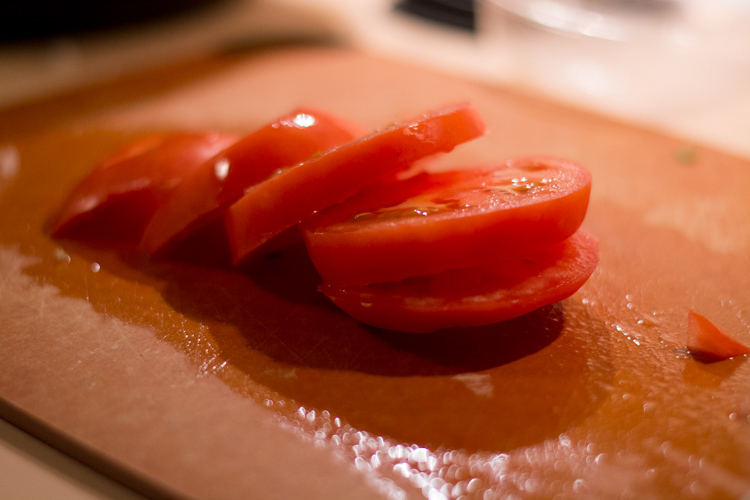 The juice from the tomato and even the cutting board seem a little darker and more pronounced. I especially liked your comment on taking the photo even dealing with wet hands and, for that matter, having a camera with you! Good questions about the ISO, David. I don’t think that was changed at all from one picture to the other, but the knife version was shot at 1100 on my D7100 and the results looks pretty clean to me. I don’t think I even considered the ISO now that I’m using Auto-ISO so much more these days! Hahaha! That’s so true, Jacqueline :) That one single knife is, by far, my favorite knife in our whole kitchen.